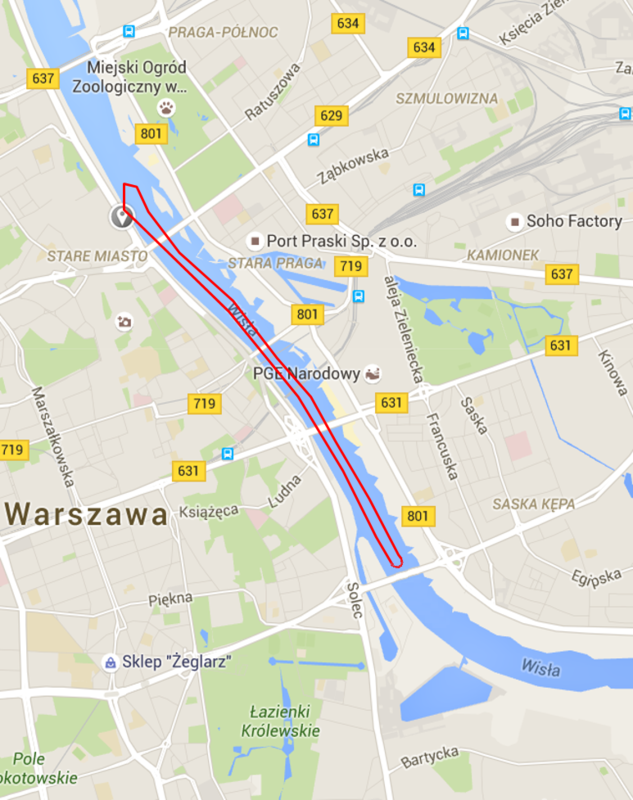 Welcome to longest regular river cruise in Warsaw - it is about 9km in about one hour ! Our daytime cruise normally starts from our harbour at Boulevard Jana Karskiego (new Wisła shore below Old Town Royal Castle), goes around 5 bridges south to Łazienkowski bridge and back to Boulevard - see the map aside. List of upcoming cruises is at the bottom of this page. On 28 December daytime crusie starts from Czerniakowski Harbour (Solec 8 street)! On the route you can admire several Warsaw attractions like: panorama of Old Town, Copernicus Science Centre from Wisła, Warsaw Mermaid, National Stadium, entry to Czerniakowski Harbour, Fat Kate water pump station, City Beach Poniatówka, natural parks on the right side of the river and more. During sunny day you enjoy it from our sun deck. Unexpected rain adds another flavour to panorama view while you are safe in glass covered, heated main deck. On the board our passengers enjoy hot and cold drinks, modern toilet, free WiFi, polish apples and candies. Our elegant ships can host no more then 12 passengers so we do recommend to buy your ticket in advance. Next 20 cruises departing from our main harbour are listed below. Click on "dzienny/daily" to enter selected cruise and buy tickets.